When most people in Florida close their eyes and think of the places most affected by climate change, overwhelmingly, the image drawn in their mind’s eye is one of a beach. One can hardly expect otherwise given the treatment mass media gives the topic, with most television segments on climate change using footage of tidal flooding, hurricanes battering exposed shores, and red tide leaving marine life to float lifeless unto toxic sands. 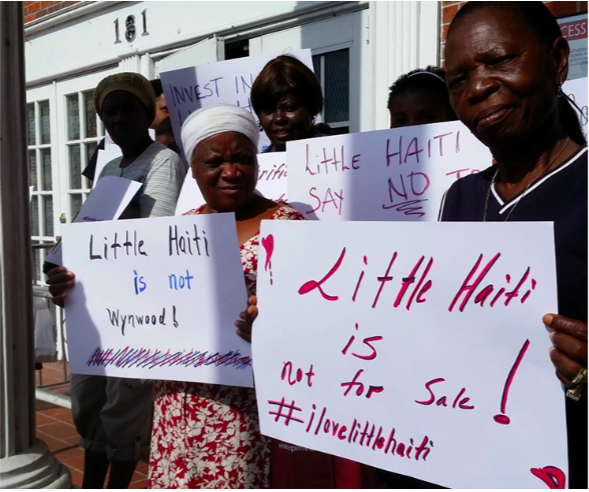 But in the dynamic neighborhood of Little Haiti, where I work, the real frontline communities of the massive climate challenge our state faces are increasingly aware that they’ll be hit first and hardest by the coming crisis. Even as expensive properties facing the water are getting most of the attention for now, it’s been clear for some years that the most wrenching effects of a changing climate will fall on us. That’s why over the span of several years, as a leader in the Haitian and Haitian-American communities of South Florida, I’ve been fighting to make sure our neighborhoods and the people who live there claim the climate fight is their fight. After all, when disaster hits, our communities are usually first in the line of fire, as tends to happen to under-served neighborhoods. This paper explains how climate change has been a rude awakening and a harsh reality for our communities, and why we need help so as not to have to face it alone. It argues that climate change’s effects on Little Haiti and other low-income communities have largely been ignored, and calls for committed action from the great majority of those who say that they are with us in fighting climate change. Communities like those in Little Haiti have shown we can lead, but should not have to go it alone. We need our partners to step up—change cannot wait. It is a guiding principle of community empowerment that the most impacted by injustice should lead the struggle against it. While it can’t always be captured in 30-second clips or social-media-friendly images, the impacts of a changing climate and rising sea levels are most pernicious and significant by far when it comes to working and immigrant communities already struggling to thrive. There are no pictures on the 6-o’clock news showing the families displaced by climate gentrification, even though being priced out of one’s home or business by speculators looking for higher ground has more of a permanent impact than, for example, being temporarily displaced by a storm. The newspapers rarely talk about how extreme weather made worse by climate change is putting a strain on our community’s migration pattern, or how extreme heat has been shown to worsen everyday gun violence. Rarely do cable pundits talk about how the current immigration enforcement policies that disproportionately affect our communities put people at risk by making them scared of seeking shelter or interacting with government—even during times of natural catastrophe. Much less are other issues tangential to a changing climate and rising seas, and that most affect the poor, ever in the public eye. I think in particular of septic tank failure, heat stroke from lack of air conditioning during extreme heat events, crop damage from salt water intrusion, and spikes in mosquito-borne pandemics, to name a few. Yet all those realities make climate change a far bigger threat to our historically Haitian-American community in Miami than most risks facing the coast. Consider the first of the issues just mentioned: climate gentrification. A study released in April 2018 by researchers at Harvard’s Graduate School of Design and Kennedy School of Government projects that climate change will rapidly accelerate gentrification in Miami-Dade County.1 The authors write that “climate change impacts arguably make some property more or less valuable by virtue of its capacity to accommodate a certain density of human settlement and its associated infrastructure.”2 In other words, vulnerability to climate change is transforming how investors conceive and calculate some properties’ value, and inverting what count as desirable and undesirable places to live. Before long, the wealthiest in Miami will abandon coastal properties for higher ground and safety from flooding, setting their sights on neighborhoods like Little Haiti. It and other inland neighborhoods have historically been left out of development investments that would benefit our communities, and disfavored by those who can afford to live closer to the shores. But with sea rise, lower-elevation areas of the city will see the prices of their homes depreciate dramatically. Landlords will sell their properties. Wealthy developers and buyers will create fancy studios elsewhere, like those already on Little Haiti’s NE 71st Street, with no affordable housing on site. Not one inch of flooding needs to be present on our inland streets for our communities to be devastated, perhaps even wiped out, by this unrelenting dynamic. And indeed, what I describe is already happening. Many in higher-elevation neighborhoods in Miami have already been evicted from their homes and businesses due to these sales or increased rent, leaving the lives of the poorest among us displaced and upended before the next storm even comes. And when it does, people of color and the poor will be hit twice as hard, yet again. Perhaps the most egregious part of this reality, however, is that because it is flying under the radar and not being explicitly linked to climate change, local taxpayers are 100 percent on the hook for any costs associated with addressing the problems. With climate gentrification ignored or tabulated as yet another indistinguishable part of the affordable housing crisis our county is experiencing, we are basically tying our hands in making sure those truly responsible for these effects are held accountable. We don’t even know what the true cost of this phenomenon is and have no true sense of what the toll will be due to the fact that Miami—ground zero for climate change—still does not account for the costs associated with it. We need state and federal resources to address our growing climate crisis. When will state and federal actors step up? In their absence, how can our communities—our taxpayers—be expected to shoulder the costs ourselves for a crisis we didn’t cause? In Little Haiti, whether or not we created the problem, we are working toward solutions. The organization that I lead, Family Action Network Movement (FANM, formerly for Fanm Ayisyen Nan Miyami, or Haitian Women of Miami), has decided to lead in the climate equity fights at our local, state, and national levels. We are not just sitting back and complaining or asking for charity. We are taking matters into our own hands and making bold steps forward. One thing FANM is doing is leading work to build a resilient green local economy in Little Haiti. Haitians are resilient people and we will rise to establish Little Haiti as the nation's first 100 percent resilient neighborhood. What exactly does that mean? Climate resilient neighborhoods are those in which communities design, plan, and implement ways to adapt social, economic, and infrastructural systems to minimize risk and harm from climate change. Becoming truly climate resilient requires considerable public investment, as I have already emphasized. But Little Haiti is making concrete steps, leading locally. Already plans are in the works to launch a circular economy in Little Haiti through establishing a thrift bazaar mecca, a folk art bazaar mecca, a food bazaar mecca, and a green jobs program. FANM wants to lead the way to making Miami the first designated resilient city in the United States.3 We want to do so by establishing Little Haiti as the hub of our region’s circular economy. We are inspired partly by the work we have seen our Puerto Rican brothers and sisters do in the aftermath of Hurricane Maria to come together and address the effects of climate holistically. We have supported their calls to action and rallied with leaders in that community that are demanding the economic and human horrors caused by that disaster be understand as a price exacted by a changing climate. But it cannot be only after tragedy that we come together. There is a glaring gap, for example, in the work of civic engagement groups nationally to draw durable connections between the global climate crisis and voting and other ways of being civically active. We know from numerous studies and polls that more and more people in our country recognize the seriousness of climate change as a global issue. At the same time, even those who say they are most concerned about the issue may not use it to evaluate candidates, or to push themselves to the polls at all. This is clearly reflected in the Haas Institute’s recent survey of Floridians, which found much higher rates saying that climate change was “very or extremely serious” than saying it was “very or extremely important” to their voting choices.4 Non-partisan organizations need to think critically about how to close this gap that mainstream environmentalism seems to be overlooking. Family Action Network Movement understands this clearly, which is why we meet weekly with members in our community to educate them about the impact of climate change and climate gentrification on their lives. This way, come election time, they can hold candidates accountable. Haitian-Americans constitute a dynamic group of voters. We organize year-round to build educated constituents because if we wait until “election season,” it is already too late! FANM needs the appropriate resources to continue leading this fight in Little Haiti. If we are to come together and bridge our divides against a threat with broad implications, it cannot be—as we have seen in other settings—by way of convenings led by the wealthy and powerful where those on the frontlines participate in a discussion or sit at a table as less than true equals. Where are our allies in this fight for our very survival? While FANM has always stood proudly with our nation’s social justice and immigrant rights communities in their legal and moral struggles, we need them now to stand with us in this struggle for our survival as a community. And we need the growing majority of people and civic organizations who recognize the seriousness of climate change to be engaged with its real impacts beyond the flashpoint moments that make headlines. They may not see these impacts directly in their day-to-day lives, and may not be aware of how tangible climate change is to many low-income communities. But the fight is underway in places like Little Haiti, Liberty City, and Overtown. The view from here is of far too many environmental and civic groups sitting on the sidelines. A broad consensus has been reached across academic, scientific, non-profit, philanthropic, media, and financial sectors that climate change is threatening our safety, health and economic futures. But we need leadership. When will all these people who know the gravity of this crisis step up and join the low-income communities struggling on the frontlines? We must fight for our communities like their very existence depends on it, frankly, because it does. We’re all in this together. Let’s be the change. 1. Jesse M. Keenan, Thomas Hill, and Anurag Gumber, “Climate gentrification: from theory to empiricism in Miami-Dade County, Florida,” Environmental Research Letters 13 (2018). 3. The Organisation for Economic Cooperation and Development (OECD) defines resilient cities as those “that have the ability to absorb, recover and prepare for future shocks (economic, environmental, social & institutional).” Further, resilient cities “promote sustainable development, well-being and inclusive growth.” OECD, “Resilient cities,” http://www.oecd.org/cfe/regional-policy/resilient-cities.htm, Accessed February 25, 2019.